Negotiating the common European budget always evokes intense disputes often threatening its approval in time but never so far has this debate started in a more unpleasant context than today - the crisis in the euro area is already threatening global economy with serious shocks. Literally days before the European Union summit and most of all the euro area summit it is not certain what precisely the solution will be, and the possibilities are becoming less and less. 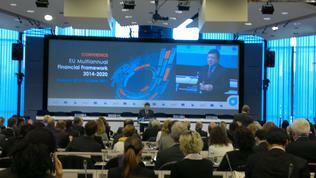 Against the background of all this, the first of its kind conference took place on the EU Multiannual Financial Framework (MFF) for the period 2014-2020, organised by the Polish EU Presidency with the participation of representatives of national and European institutions. 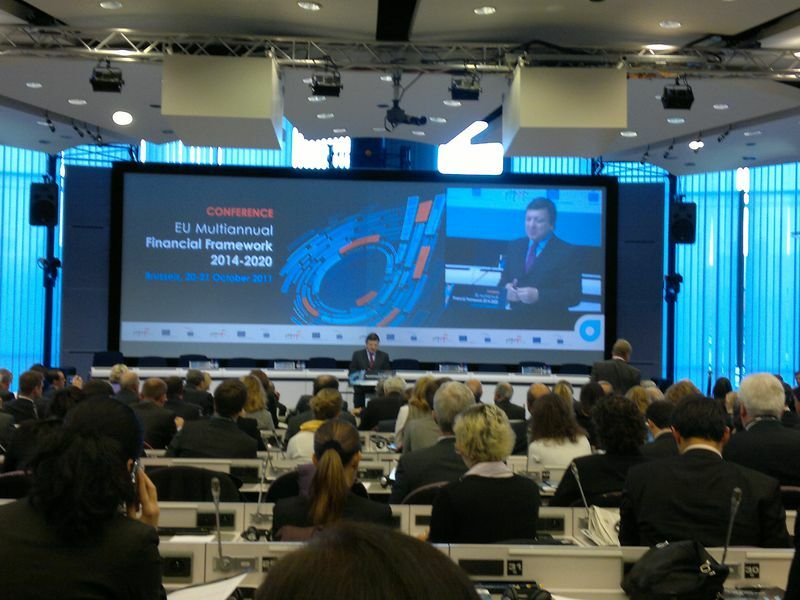 The conference was opened by European Commission President Jose Manuel Barroso who chose to start instead with the Commission's proposal for the next MFF, focusing on the main priority areas for funding, he started with the words: "This conference is taking place on the eve of one of the most critical European Councils in the history of the European Union. The European Council that will also be followed by a Euro area Summit. The decisions taken at this weekend's summits, ahead of the G20 summit in Cannes two weeks from now, will be crucial to tackling the systemic crisis that is now unfolding". Mr Barroso did not end with this, he continued with the issue about the expected solutions on Sunday by saying that he hoped the leaders to agree on the proposal for leveraging of the EFSF. According to him, a positive outcome was possible on October 23rd but only if there was political will and a sense of compromise from all participants. "Europe needs this effort of compromise. We are in a situation where this compromise can be reached around a more ambitious Europe. I am confident we will do it". 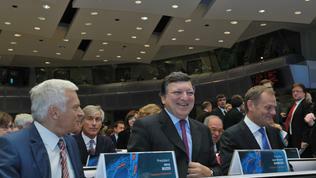 After this introduction, obviously aimed at showing the participants that Europe is on the verge of something after which it might not be necessary to discuss a common budget, the European Commission president continued with his main thesis, defending the MFF proposal, the idea to introduce a financial transactions tax (FTT) and the measures to boost growth. Against the backdrop of the introduction of the president of EU's executive, European Parliament chief, the Pole Jerzy Buzek, sounded a little bit unreal. He started his statement by recalling the significantly increased powers of the European Parliament with the entry into force of the Lisbon Treaty, by even quoting precisely which article of the treaty gives these enhanced powers of the only EU institution whose members are being directly elected by the European citizens - article 324, which, Buzek said, envisages the necessity the European Parliament to be involved from the outset in the debates on the MFF. After concluding with an outline of the European Parliament's role Mr Buzek started explaining why a common European budget was needed. It is not just necessary but it has to be big too. 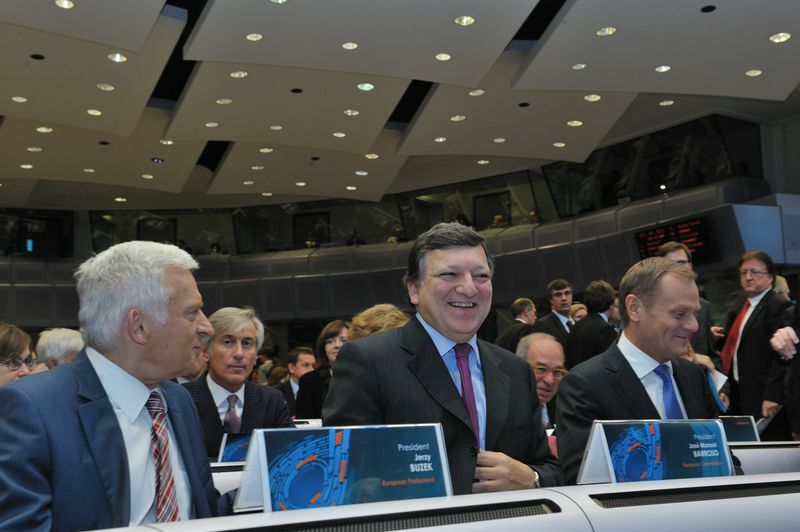 "The EU is a an economic giant but a political dwarf", Buzek recalled the famous European phrase. "We cannot react to the numerous threats coming from outside the EU; we have problems on the other side of the Atlantic ocean; climate change, terrorism, neighbours from the east, the Western Balkans, from the south. There are threats to EU's balance. 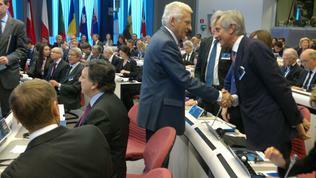 And all this needs money", Buzek explained without reading from a prepared speech. The European Parliament chief reiterated the constantly repeated position of the institution that a 5% increase of the budget is insufficient. 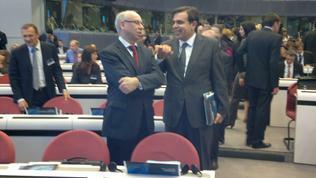 "As Mr Barroso said, a 5% increase is a very humble objective. Quite definitely these 5% will not satisfy all our needs. [...] Let us be optimists - we will not live in a crisis forever. 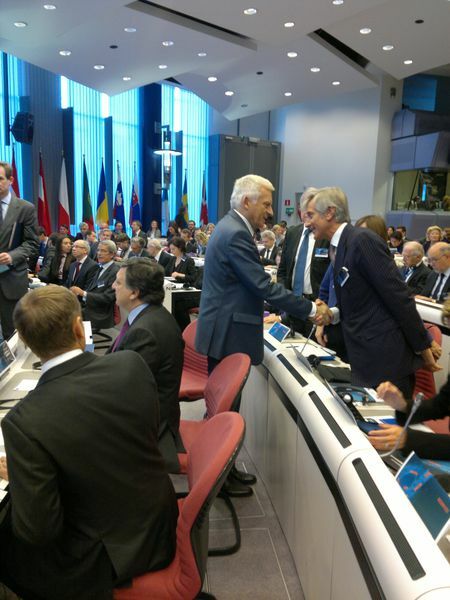 In several years we will need money to make the next leap forward", Buzek concluded. Polish PM Donald Tusk in his part, who is the main initiator of the conference in his capacity of a EU president, emphasised on the need to boost economic growth because it was growth that would recover confidence in the EU. He imported a very interesting element in his speech by pointing out that in the last months "we are again hit by the crisis, the debates of the member states continue with those who wish to join. Those are countries that invest huge energy in their preparation in order to be integrated. According to them the EU has a future. If they did not believe in this future they would have never tried to join", said Tusk with which he as if wanted to say to the leaders - don't destroy the EU, at least because of the candidate countries who rely on it. Tusk, just like his compatriot Buzek, emphasised on the need of completing the single market and said that the main source of strength for Europe was solidarity. In conclusion Donald Tusk urged: "I urge you to be honest in this debate. Don't get influenced by the wrongly perceived political correctivity or national egoism. In this debate we cannot talk about taboos because EU's future depends on this". With fateful words EU Budget Commissioner Janusz Lewandowski, by the way also a Pole, opened the real debate: "The biggest issue is not the budget, it is the context. The big issue is the social and political context". What impressed was that, unfortunately for moderator Ann Mettler, Executive Director of the Lisbon Council, no one from the national representatives that spoke did not pose a question to the commissioner. Instead, most statements were related either to sharing experience what helped in a country to absorb funds or what was needed to be done. Very impressive was the fact that most active were the representatives of the Baltic countries. 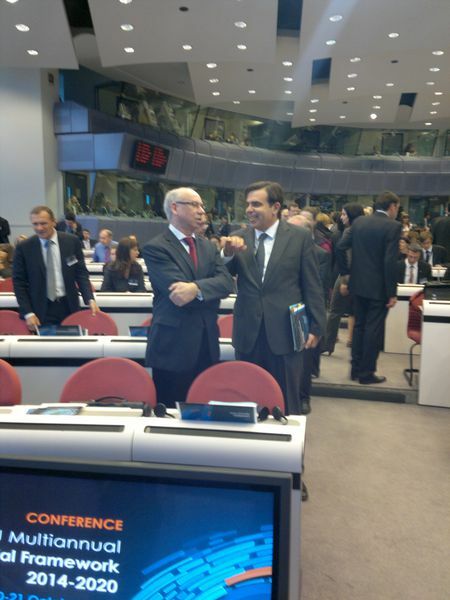 They spoke mainly about either the Common Agricultural Policy or about the Cohesion Policy. According to a representative of Lithuania it was necessary the Cohesion Policy to contribute significantly in reducing divergences between regions in Europe, but also between citizens. He regretted that in this sense the European Commission's proposal did not respond to this principle as it punished the countries that needed this policy the most. According to him, the budget should ensure consolidated efforts to invest more in countries who had proved to be using the funds in a responsible and efficient way. A similar measure is envisaged in the proposal of the Commission - based on an estimation of the results and when progress is not registered funding should be frozen or stopped. The essential debate on the new budget will start when some specific numbers are put on the table. The statements so far, however, are not in the optimistic spirit for which the EU leaders called and express more or less fears whether there will be any union left by then.